My Girls | Nicole, Deipnosophist. I’ve posted before about my dog and her health problems. Her joints have degenerated and the surgeon says she’s too old for the risk of another surgery. Sunny’s heart is still weakening and is in the last stages of failure. She has good and bad days, good and bad weeks. Toward the end of August we started talking about the potential of euthanasia, then Sunny bounced back to life. I’m sad to say her seizures have returned full tilt this week. The seizures are so bad for her; she yowls in pain, loses all bodily control, and falls to the floor, her back arched and her tongue lolling out of her mouth. Small seizures last a minute. Large seizures last longer and she can’t move for at least ten minutes afterward. But today among the sadness of yet another seizure, something good happened. My daughter ran over to Sunny to comfort her. While Sunny was still seizing, Ainsley laid her head close and rocked Sunny in her arms. I snapped these pictures as Sunny was reviving and gaining muscle control. 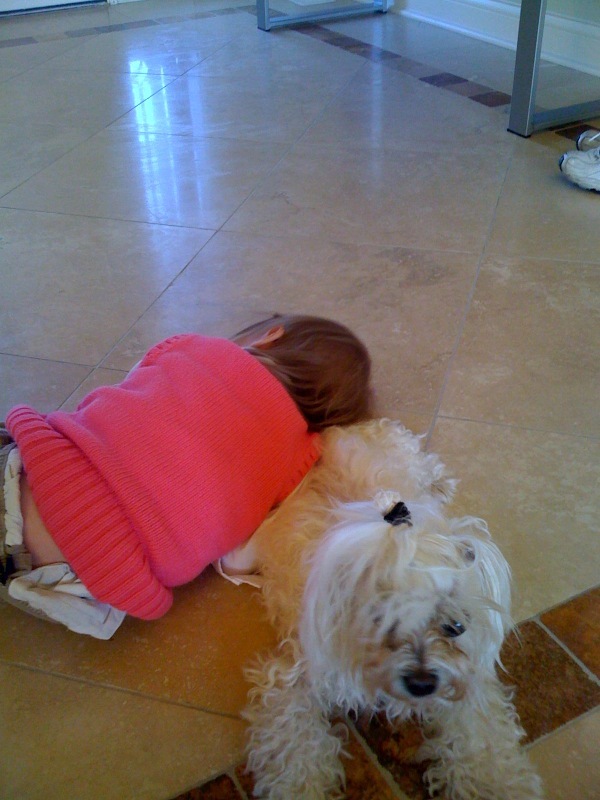 Ainsley stayed with Sunny throughout the ordeal and never once pulled Sunny’s ears or tail. Contrast these pictures with just one week ago. 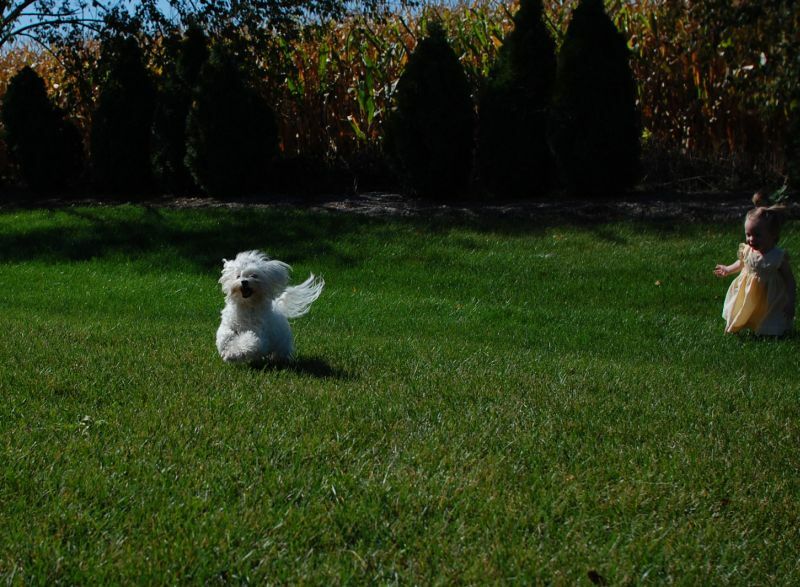 This is the essence of Sunny: her little spirit beaming out as she bounds along. 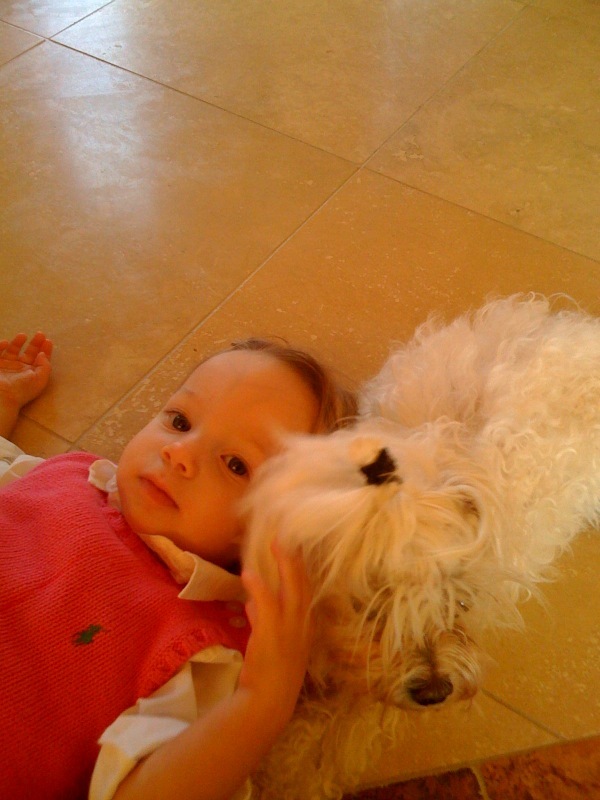 She has always disliked children but has been very patient and tolerant with Ainsley. I feel that Sunny’s generosity with Ainsley has shown Ainsley how to respect her pets (she is also very sweet to the cats and VERY sweet to Silo). Things are worsening and I know I’m going to have to say goodbye soon. In the meantime, I’m so happy that I’m raising a little girl with so much compassion and that I live with a dog who has given so much love. I’m so sorry to hear about Sunny, but it sounds like her life has lived up to her name. I got teary too. While the outcome is pretty much known, you’ll always treasure those times and those pictures. Isn’t it amazing the capacity both of them have for understanding each other? And Ainsley really is great with the animals–I have been really impressed with her, watching her pet Silo.